It was at around midnight; the skies were pitch black, and the streets were empty, save for a few jeepneys that roared every now and then. A few lampposts lined up along the sidewalks; their white lights somehow fell down on me and put me in the spotlight. I was wearing black jeans that had paint stains on each side, and sneakers that had drops of paint on them, the sides of the rubber soles that were once white were now dirty gray. I had a zipped up hoodie on, and a camo backpackwhere rattling sounds came from as I walked on. I had no particular place to go to. I just kept on walking, looking, spotting―tagging. Clack, clack, clack, clack, clack, I shook the aerosol can in my hand, and pffsshht,pffsshht,pffsshht, it went. I tagged on the cream-colored wall of some commercial establishment. 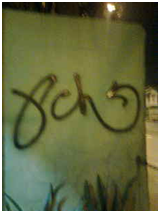 It was in 2008 when I began bombing, and “Pch” was my writer name. Essentially, it was the infamy accompanying graffiti that drew me to it, the feeling of seeing my tag on public spaces; on walls that I pass by every day, on spots that make people think, “How did he do that?” I would place my name on anywhere as long as there was a chance that a lot of people could see my name. Bio, a graffiti writer featured in the documentary, Bomb It(2008), defines the roots of graffiti: “When you go to the very essence of the graffiti movement, it’s all about the signature and the tag.” And Pose2, another graffiti writer also featured in the documentary, describes the method of bombing, a term used by most graffiti artists who affiliate their style with the illegality of tagging and hitting hard-to-reach places known as “hotspots” in the silence and darkness of the dusk. He says: “Bombing is just all out destruction, going all out; you know, bombing? Justlike dropping a bomb.” Graffiti, by nature, is done illegally on public walls and spaces such as trains, police cars, bridges, and street signs. And this illegality excited me every time I went out at night to bomb. These nightly escapes of graffiti brought me to a point that I always brought a can of spray paint in my bag, just in case I get the chance to tag on my way home. 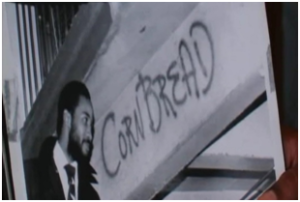 The graffiti movement began in 1967, in the streets of Philadelphia, by an African-American tagger known as Cornbread. In Bomb It, it was shown how he began writing the word “Cornbread” on the hallway walls of the juvenile institution that he was in; where cornbread was served on their plastic platters every lunch, instead of white bread, and he thought that it had a ring to it. Everybody in the jail talked about his “name,” and he figured that if he had been getting this much attention inside, what more if he wrote “Cornbread” outside. “The more they talked, the more I wrote, the more they talked, the more I wrote,” he says. I was unaware of Cornbread and the history of graffiti when I began doing graffiti, or “writing,” as graffiti artists are also known as graffiti writers. It was the video game, Tony Hawk’s Underground 2 that got me into graffiti, because aside from playing the game as a professional skateboarder, there were side-quests that involved tagging hard-to-reach areas. What I realized when I began to hit the streets was that I wasn’t the only one doing it. I started to take note of the other names and symbols that were spray-painted on walls. A lot of other writers were really “out there,” with their tag names being visible from Pasay to Taft, from Taft to Quiapo, and from Quiapo to Quezon Avenue—main thoroughfares in Metro Manila for public transportation. It was a challenge for me to become as visible, to get noticed, and to become better. And that was when I began to look at photos and watch videos of famous American graffiti writers and bombers, such as Augor, Saber, and Zeser. 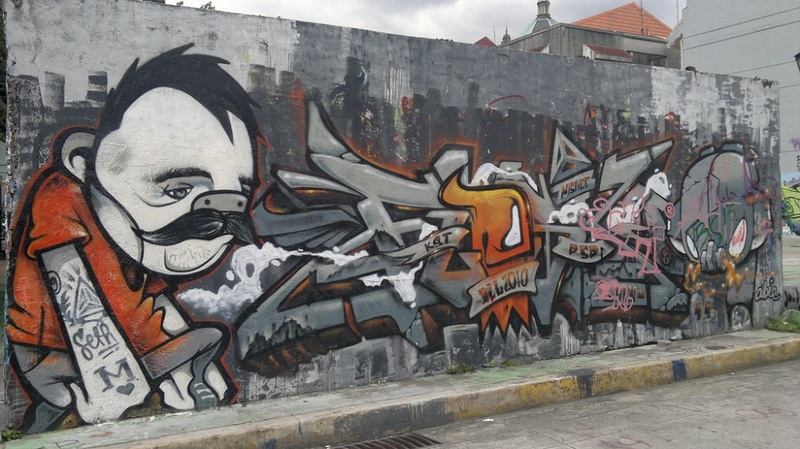 In the Philippines, there were writers who began as early as the 90s, such as the SBA cru and Pinoy Style Insight or PSI, but I can say that graffiti has been in the country for a much longer period of time, most likely due to the relationship it has with gangs. 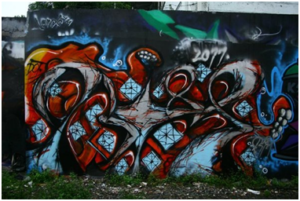 But the actual “boom” of graffiti art was back in 2004-2006, and it involved a group of writers from different crews who had been acknowledged as the first wave for beginning the movement and establishing the scene. 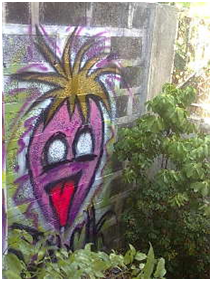 I spray-painted a strawberry face on a wall of a lot filled with huge ants, wild bushes, and tall blades of grass. I asked permission from the owner of the wall, and she agreed, as long as it wasn’t anything scary, ugly, or “bad.” I promised a cute work, hence the strawberry face with its tongue sticking out. I didn’t feel the same contentment or excitement in executing this piece, unlike when I’m graffiti piecing, where by the end of a work, I can barely move my fingers. It was different for me, although some people categorize graffiti under the umbrella of street art. Technically, though, it has its own history altogether. Street art began in the prehistoric ages,andit roots itself in the earliest known cave paintingwhich can be found in Europe, which dates back to the Aurignacian period (ca. 45,000 to 35,000 years ago). By scratching the stoned surfaces and rubbing leaves, mud, chalk, and clay on the walls, cave men were able to decorate their caves and surroundings with ancient lettering, animal-like shapes, and geometrical symbols―these were the unconscious beginnings of street art and its culture. 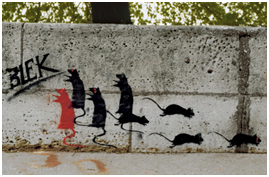 Graffiti and street art, in general, are both projected as a form of ephemeral art, which in some way, reflects the artist or writer’s lifestyle: momentary and transitory. 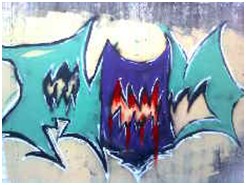 Given this, some people may disagree with Rai or Roy, as some “purists” believe in the real essence of graffiti as an illegal act, as an art in the form vandalism. Still, without any sacred scripture on its rules, graffiti and street artists will have their own criteria for the value or beauty of the art form. For others, graffiti and street art is just a phase in their lives, while for others, it has become their lifestyle. The lifestyle of a graffiti writer or street artist requires one to be hard-nosed, physically and mentally―to be somewhat of a thrill-seeker, constantly testing one’s toughness, and breaking the rules and boundaries of life, society, community, or whatever it is that hinders them from pushing their selves. It has been a part of my life, when every day I dream of hitting spots that I pass by when travelling, but couldn’t because I was too scared to. I would always feel this need to surpass someone who suddenly tagged on the same spot that I did, or whenever I would see a photo of a really sick piece by a fellow writer. Again, there are going to be purists who will find it unfit for writers to post photos of their pieces, tags, or throw-ups on social networking sites, such as Facebook, for the reason that graffiti should be presented in the streets, and that public space, in itself, is the writer’s gallery. The use of social media is already breaking the notion that “graffiti is meant for the streets,” so in using these platforms, these purists will say that one might as well just paint on your own wall at home, take a photograph, and upload it on your website. One could say that the internet is the future of graffiti; that it is as public as the streets. 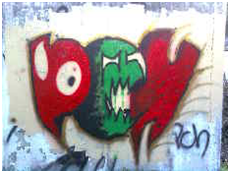 It is, however, without a doubt that the illegality or legality of a work is deemed significant to some graffiti writers because for most of these practitioners, it is the level of difficulty and the challenge of conquering fear that matters to them, while for other artists, it is more on the creativity, meaning, and connection to an audience that makes their work more valuable. And in the Philippines, both public art forms are enjoyed by the artists and the viewing public, because wherever they go, these art forms are there. Even without the spotlight on me any longer, I know that I have lived through my tags and pieces. I’ve accepted that the permanence of my art can only last for so long, but I will constantly be walking, looking, and eventually, stopping.